I recently returned from a three week trip to South Africa and Kenya. The South Africa portion of the trip was to attend and participate in Cape Town 2010 – the 3rd Lausanne Congress on World Evangelisation. Today’s post is my first reflection on that meeting. Note that these are general comments, not limited to the particular focus of this blog, which is creation care. That topic did come up, and I’ll address it in a separate post in the near future. The second half of the trip involved a visit to the Care of Creation project in Kenya, and that also will get its own post later this week. My seat-partner on my flight from Johannesburg to Cape Town was moaning about the problems she had getting a hotel reservation in Cape Town for the Microsoft software conference she was attending. None of her usual hotels had anything available. ‘Oh, I can tell you why that is,’ I said, helpfully. ‘That’s because of the conference I’m attending.’ Five thousand church leaders descending on Cape Town was not what she expected, and I could tell it was stretching her categories a bit. On the other hand, I’m a veteran of many large (usually Christian) conferences, and I thought I knew what I was coming to. Not so much – Cape Town 2010 turned out to be much more than I expected as well. There were many highlights. Thinking back over those 8 days, a number of images come to mind: Libby Little, her husband having been one of those martyred in Afghanistan only weeks before, testifying to the grace of God in a time of intense grief. A teenager from North Korea, having lost one parent to cancer, the other to political persecution, sharing her desire to serve God no matter what. 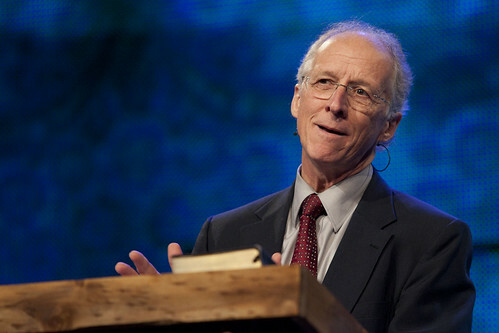 John Piper, eloquent and passionate in his exposition of scripture. A brother from Rwanda describing how he suffered – and survived – the holocaust in that country, and sharing with us his thoughts on the inadequacies in the gospel that made that tragedy possible. Two giants of the faith, Samuel Escobar and Renee Padilla, interviewing each other about their own experiences serving in Latin America over the last 50 years, and looking ahead to the next. Exuberant worship in the African vernacular, along with many other flavors . Praise songs in half a dozen languages and old English hymns in dozens of accents sang equally well. And through it all the joy of spirit-engineered encounters in the hallways – old friends from earlier conferences (“Yando! What are you doing here?? ?” “Same thing as you, Ed!”) and many, many new sisters and brothers. Not least among all these images, the sight of 4000 people all seated at assigned tables in the main hall doing “manuscript Bible study” (IV/IFES people will know what I mean). It was kind of required small groups. And it worked – Christian conferences may never be the same. As part of the world wide church, I am (we are? )part of something far bigger than I usually realize. The numbers speak of diversity: Four thousand participants from 198 countries, all carefully chosen for their differences. 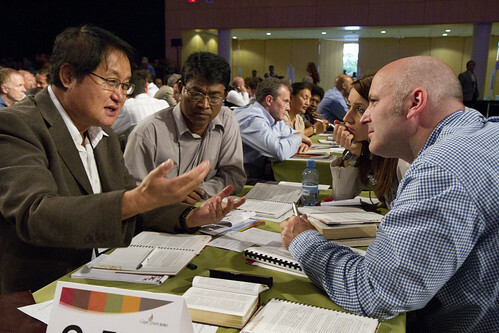 This was an ‘invitation only’ conference and the organizers worked hard to create an assembly that would do justice to the glorious variety in the global church. Men and women, young leaders and old, battle scarred veterans and seminary students, professional church leaders and business people, leaders of denominations measured in the millions and pastors of tiny worshiping groups in the jungle – this crowd had nothing in common with itself. There were six official languages – need I say more? No, we had nothing in common – except Jesus. There was a deep “shared culture” evident that included shared beliefs, a common respect for biblical preaching and teaching, and a great deal of shared music. 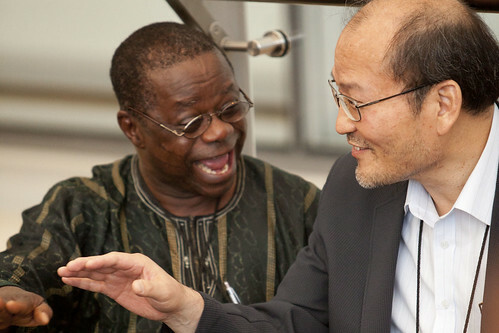 If one of the marks of a culture is its folk music, the way in which both new and old music crossed language and cultural boundaries at this event would seem to be proof of the organic unity of the worldwide church. I have had some experience of multinational gatherings in other contexts: Groups of workers or organizations brought together by disaster or convened around a cause by an agency like the United Nations. Countries meeting over a common problem or challenge. These meetings are minefields where every statement is offered in measured and nuanced phrases, and is parsed oh-so-carefully to discover the agenda behind the meaning behind the words. Mutual suspicion and backroom attempts to maneuver for advantage are the name of the game. But not here. Oh, sure – there were disagreements. John Piper’s view of the atonement, Os Guinness’ take on “truth” were not taken as universally valid statements, and there were plenty of participants who would be happy to let you know that. But these were the kinds of discussion that my own family is famous for: loud and passionate and possible because we are part of the same family. We can disagree and still love and trust each other. And, honestly – what other institution in human society could gather a group of people from every corner of the earth and discover that there are songs almost all of them already know? That what they agree about and what they believe in is so substantial that it overwhelms those occasional areas of disagreement? We are close to realizing the fulfillment of Jesus’ last command. The goal of the church from the time of the earliest disciples right to the present has been to preach the gospel of Jesus to the very ends of the earth. This was, after all, the third “Congress on World Evangelization”, and this meeting made me think we’re pretty close to achieving that goal. It’s only taken 2000 years, but the end may really be in sight. The conference location was significant and highly symbolic. Geographically, Cape Town is about as close to the “end of Africa” as you can get and as such is a decent proxy for the “ends of the earth”. What was a lonely outpost of empire not so very long ago is now the site of a great celebration of the gospel having gone, almost, to the ends of the earth. And Africa, once called the “dark continent” by Europeans, is now the continent where the church is growing fastest. For example, there are more Christian students in Nigeria than in all of North America. Frequent references to “the global south” were reminders that the great nations of the world that were mission fields a century ago now represent the new center of the worldwide church. Many of them are in fact sending missionaries to the countries from which missionaries came to evangelize them in the last century. The largest missionary force in the world is Korean. Need we say more? No, the task is not yet finished. A session on “missing peoples” reminded us that there are still pockets of tribal, ethnic or linguistic units where there is no witness to the gospel, and missionaries are still needed. A fascinating development (new to me, at least) is an emphasis on “orality” – finding ways to take the message of Jesus to people who cannot, or do not read the written word. This is a fascinating parallel track to the long effort to translate the Bible into every language on earth. Not finished, but amazingly close. If basic evangelization has been remarkably successful in my lifetime, the uneven development of the church shows some serious gaps. Planting the seed is only part of Jesus’ command – what he actually told us to do was to ‘make disciples’ (Mt 28:19) and some of the problems in the world can be directly tied to our failure to move from evangelization to discipleship. One of the most powerful talks at Cape Town was from Antoine Rutayisire from Rwanda. A survivor of the Rwandan holocaust, he offered a perceptive critique of the church – and missionaries’ – roles in that tragedy. The problem for us is this: At the time of the Rwandan genocide, that country was one of the most “Christian” in Africa, yet those same church members used machetes to hack each other to pieces, and church buildings to burn their own spiritual brothers and sisters to death. Antoine’s critique (you need to listen to his talk or read the original paper) was but an extended version of Renee Padilla’s very brief answer to a simple question: What concerns you most about the future? Three things, he answered: 1. The lack of discipleship in churches. 2. Globalization. 3. The ecological crisis. Renee would have connected his sentence with Antoine’s talk like this: We have tragedies like Rwanda in Christian nations because we have neglected discipleship. We have tremendous poverty in large parts of the world, in spite of the advance of the gospel, because of the perpetration of a fundamentally unjust economic system that has seduced large portions of the church. And we are threatened with a global ecological collapse in part because the global church has done nothing about it. And so we come back to the central theme of this blog – creation care. Though there was little in the main sessions about the crisis in God’s creation, the Congress produced a document called the Cape Town Commitment that has a powerful statement on Creation Care. Some of us are in communication with Lausanne leadership on this topic – stay tuned. Meanwhile, please take the time to watch some of the Cape Town videos, and even join the Lausanne Conversation web site. Your voice matters.